At over 200,000 acres, Baxter State Park is the crown jewel of Maine’s north woods. It is also a hotspot of plant biodiversity, harboring many rare and endangered species. Most botanical research has focused on the alpine areas of Katahdin. Until recently, plant biodiversity in the remainder of the Park was still largely unknown. This lack of information was a pressing management issue, and made it difficult for Park staff to protect resources effectively. In 2012, Friends of Baxter State Park launched the Plants of Baxter State Park project in partnership with the Maine Natural History Observatory, Baxter State Park, Stewards LLC, University of Maine Herbarium, and the Maine Natural Areas Program. The project set an ambitious, five-year goal: a complete plant inventory of Baxter State Park using citizen science and the support of Maine’s finest professional botanists. Engage citizen scientists and the public to take an interest in the plants of Baxter State Park and Maine’s north woods. Between 2012 - 2015, 66 volunteer citizen scientists spent 4,256 hours on research expeditions in BSP led by professional botanists. Field teams identified 260 plant species never before found in the Park, and collected over 17,000 digital photographs and GPS coordinates. Field research on the project concluded in 2015. The project enjoyed tremendous public support, with donations from Baxter State Park, Conservation and Research Foundation, Friends of Baxter State Park, John Sage Foundation, Maine Community Foundation’s Fund for Maine Land Conservation, Maine Natural Areas Program, Maine Natural History Observatory, Maine Outdoor Heritage Fund, Margaret Burnham Charitable Trust, The Natural History Center, Norcross Wildlife Foundation, The Home Depot Foundation, Stewards LLC, and The Waterman Fund. In late 2014, a crowdfunding campaign raised $12,000 from 113 donors in less than a month to support publication of the field guide. 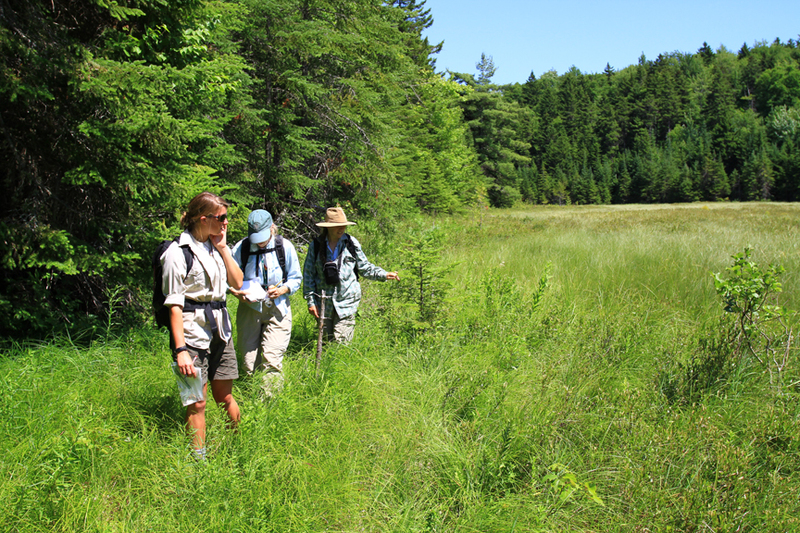 A team of botanists working on field research for the Plants of Baxter State Park project. On August 23, 2016, the University of Maine Press published The Plants of Baxter State Park field guide in association with the Maine Natural History Observatory, Friends of Baxter State Park, and Baxter State Park. Four years in the making, this guide represents an incredible conservation tool for Baxter State Park, and a new way for visitors and staff to understand the Park's biodiversity and wilderness landscapes. At 6 inches by 9 inches in size, the field guide will fit easily in a backpack. It includes all 857 species found in Baxter State Park, with a complete description of each species and over 2,000 color photographs. The guide also includes excellent flower and leaf keys developed by Glen Mittelhauser. These keys help to narrow down the choices quickly when you are confronted with an unknown species. The guide is split into four primary sections: 1.) wildflowers and low shrubs; 2.) trees and tall shrubs; 3.) ferns and other spore producing plants; and 4.) grasses, sedges, and rushes. Within those four sections, species are grouped alphabetically by family. It also includes information on the abundance of each species in the Park, and useful notes on conservation status and similar species. The Plants of Baxter State Park field guide is available for purchase in FBSP's online store, as well as at bookstores and other retail locations throughout Maine. 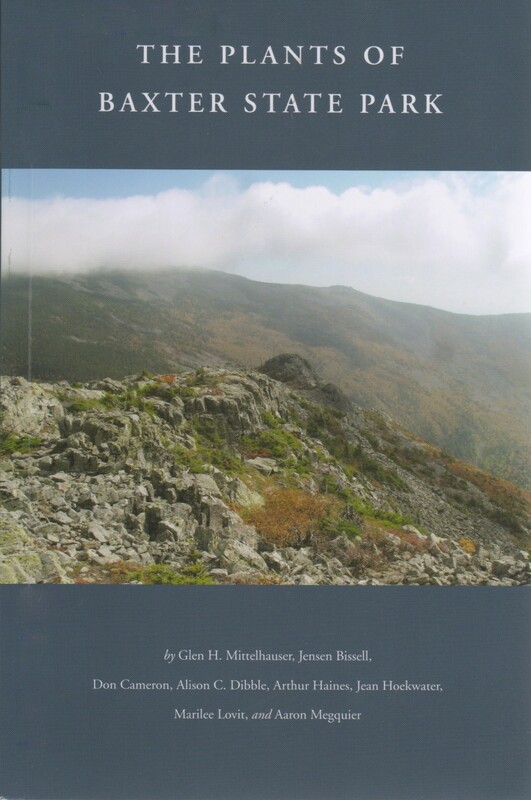 The Plants of Baxter State Park, published in 2016 by the University of Maine Press.